And those would be the noises you hear when I’m in a situation where I feel uncomfortable and thus awkward. Everyone has their awkward moments. 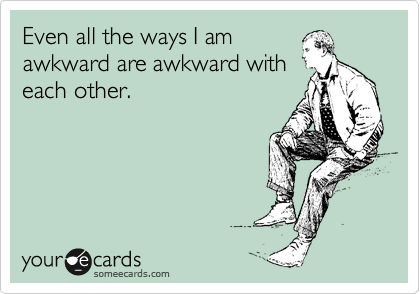 I however seem to have an awkward life. I have mentioned this before but I am a shy extrovert. I get my energy from being around others. I don’t need to say anything to you but just being around people energizes me. Sometimes it feels like I have a superpower of draining other people’s energy so that I can go be alone for a day and I’m perfectly fine til I need to recharge again. However just because I’m an extrovert doesn’t mean that I’m outgoing. Far from it. Put me in a new situation with people I don’t know, especially people who already know each other, and I want to die. I feel out of my element and utterly uncomfortable. It doesn’t help when no one includes me in the conversation or comes up to me first. I do that awkward thing of trying to join in a conversation and can’t seem to jump in. I never seem able to find the right moment to come into a conversation. Either my voice never gets heard or when I finally do say something there’s an awkward silence. I seem to know a lot of outgoing introverts. They recharge by being alone and are quite happy with that, but when they are out in public, you would never know this because they are good at being around others. They hide it so well that when they tell you they are actually introverts, you’re like no you’re not. LIES. When I’m around people who I’m comfortable with, I have no problems. Even when I’m awkward with them, I know they’re not going to judge me so I feel completely fine being who I am in front of them. In fact I have been told many times after an entertaining awkward moment “Deborah, don’t change. Never change who you are”. My friends have noticed that when I’m around someone I would like to get to know better and it’s a group setting, I clam up instantly and start acting very not like myself. It’s because I get nervous and anxious. They can tell that something is wrong because it’s a different type of awkward. It’s the awkward where I am overly conscious of trying to make a good impression that I tend to shut down in fear of looking like a fool. And if you know me very well, you can probably tell that I’m visibly not at ease. Because I’m worried about looking too overly interested, I may over think myself into panic status and act completely indifferent towards you. Even though that’s NOT how I am at all. So if you are trying to see what kind of person I am, and we’re surrounded by people who I’m not necessarily comfortable around, you’re not going to see the type of person I really am. I like getting to know people better one on one vs in a group setting. At least in the beginning anyways. Once we get past the initial getting to know each other stage, then things are so much better. You may not care how you come across to me, but I know for me, while I want to be myself, I also want to make a good impression to you. So in a group setting, when I’m having to fight that inside of me PLUS having to battle with everyone else and their personalities and actions, it’s very overwhelming. When I’m in a more one on one setting, I can relax. I’m more confident and can be comfortable when I’m not in a group. I can surprise you. Of course I realize that for some people, group settings are safer and more comfortable for them. To each his own. Being awkward is a part of life. You can’t avoid it. You just have to accept it and live with it. And you never know, your confidence in not caring that you are awkward is the very thing that someone finds absolutely attractive about you.